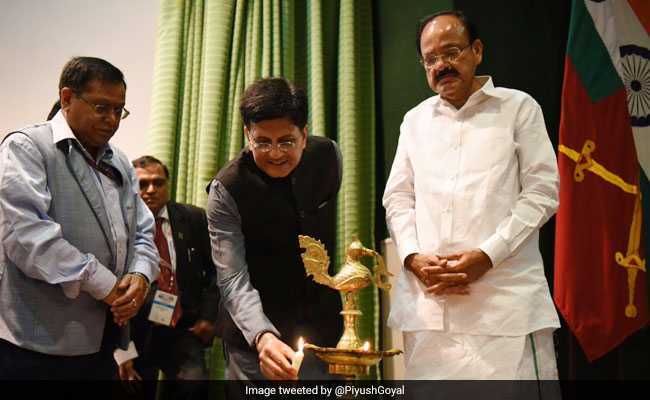 Speaking at the International Conference on Technological Advancements in Railway and Metro Projects which was also attended by Vice President M Venkaiah Naidu, Piyush Goyal said that budget allocations are a limitation and tend to hold back research and innovation. New Delhi: Railway Minister Piyush Goyal today called for innovation in making the railways safer while stressing that enough money is available for the purpose. Speaking at the International Conference on Technological Advancements in Railway and Metro Projects which was also attended by Vice President M Venkaiah Naidu, Mr Goyal also said that budget allocations are a limitation and tend to hold back research and innovation. "Personally, I believe a budget is a limitation, it holds you back. Allocation of a budget doesn't allow scientists to flourish as he wants to. Budgets restrict innovation," said Mr Goyal as he called for out-of-the-box thinking to improve rail safety features like as signaling systems and fog vision for locomotive pilots. The railways is embarking on a massive programme to ensure safety of the entire network, he said. "As much money as required is available for safety. "I am not even saying it will be made available, I am saying it is available," he said, adding that he cannot make the railways safe without new ideas and he hoped that the conference will help generate innovations. After a September 30 high-level meeting on Railways safety in Mumbai, it was decided that foot overbridges, platforms and pathways on platform ends will have the highest priority as safety items with no budgetary restriction. This follows the furore raised after the stampede on a foot overbridge in Mumbai last month. The rail minister also pointed to Vice President Naidu's speech on September 27 at the IISc Bengaluru where he said that innovation plays a key role in driving the knowledge-based economy. To highlight his point, Mr Goyal said that the last time a train with additional speed, comfort and safety features was introduced was way back in 1969 -- the Rajdhani Express. "From 1969 to 2017 we have not embarked on any major new technological initiative that will take us to international standards of passenger safety, comfort, convenience and speed," he said. Japan, he said, has progressed technologically as it has managed to create an ecosystem where scientists and researchers can think out-of-the-box. "Our plan for the future is to create an ecosystem where the scientific community will choose to stay in India and not go to NASA," the minister said. He said the railways is open to engaging with experts in improving the environment, stations and passenger convenience. Enumerating his expectations from the scientific community, the Railway Minister said he needs technology and know-how to improve driver vision during foggy weather, make the signaling system better, manufacture tracks faster and more efficiently, and predict track failures or fractures. "I do believe that the time has come for us to aggressively go in for newer technologies and better ways of doing work. We will have to work collectively to see what can be done faster and smarter," he said. His comments come in the wake of serious questions being raised on railway safety following a string of accidents over the last few months. Ten coaches of the Kaifiyat Express derailed in August, injuring more that 20 people. This was the second rail accident, coming only days after 23 people were killed in another derailment in Uttar Pradesh. In the same month, nine coaches of the Duronto Express derailed in Mumbai, although no casualties or injuries were reported. The Rajdhani Express traveling from Jammu Tawi derailed in New Delhi in September, a week after the Shaktikunj Express derailed in Uttar Pradesh.